It’s 2017 and everyone and their mom is making an SUV. Lamborghini’s making one. Ferrari might make one. Even Rolls-Royce is making one, though the company has stubbornly refused to call it that. I totally get why now. Because, honey, Rolls-Royce isn’t making an SUV. It made a damn truck. We spotted the Cullinan mule once in July, but for some reason, it looks even more goddamn massive in this new video uploaded by spy photographer Carspotter Jeroen. Look at how tall it is! 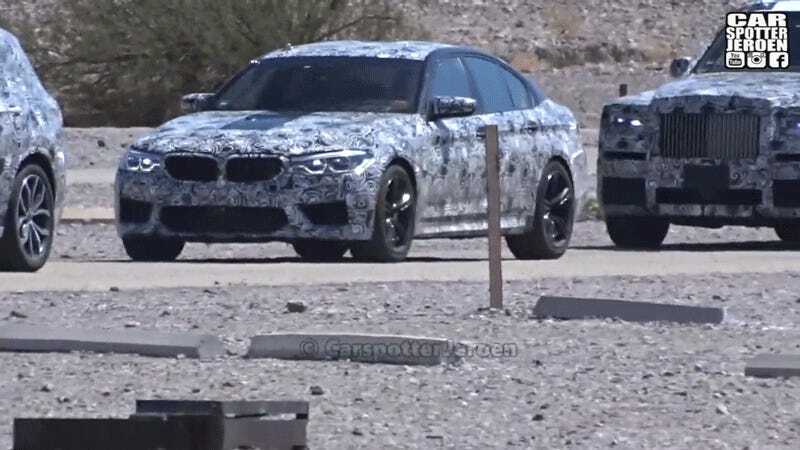 The Cullinan is parked behind what appears to be a BMW M5 mule. Knowing what we do about the current 5 Series, we can safely say that is isn’t a small car! The Cullinan absolutely dwarfs it. We’re also quite sure it isn’t the new Phantom either. That’s behind the Cullinan and is smaller. Rolls-Royce has gone on the record twice (to our knowledge) to say that the high-sided, all-terrain, all-aluminum-boned vehicle that it’s making is not an SUV. And I was skeptical at first. I thought this was just Rolls-Royce pulling one of those, “We’re so exclusive, we’ll make the thing that’s totally a thing but call it something else” things. Nope! Say hi to the new Rolls-Royce Truck.